In my quest for gear to review, I literally spend hours each week poring over the Internet and trade rags, looking for cool, new stuff, and I get especially excited when I come across familiar gear that’s expressed in completely new ways, such as the Quantum Drive from Acoustic Imaginearing that uses quantum tunneling to provide distortion. But a couple of weeks ago, I ran across a brand-new guitar company up in Washington called “Woody B Internal Combustion Guitars,” that is doing something so totally unique it has the potential of completely changing how we as guitarists approach tone. I don’t say this lightly. What Woody has invented is nothing short of amazing, and I am extremely excited to have run across this new guitar. What makes these guitars so revolutionary is Woody’s invention: The Internal Combustion Drive System. This consists of a speaker transducer and special baffles and tone ports that direct added resonance to the strings and body. 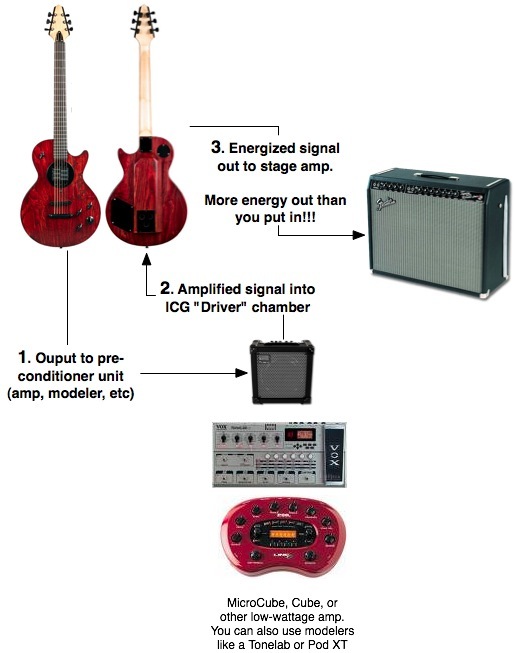 Essentially, the Drive System is a resonance chamber that builds up the guitar signal (with the help of a pre-conditioner that I’ll get into later) before it goes out to your main amp. According to Woody, whom I had the pleasure of speaking with for quite awhile yesterday, this is a guitar where you can feel your tone resonating throughout the guitar’s body. That signal is returned via a special plug that Woody provides that I assume returns the “conditioned” signal as a line-level output (though with a Cube, you should be able to use the Recording Out). The signal then passes into the Drive System, where it’s run through the speaker transducer and allowed to resonated withing the chamber. The signal is buffered, then sent out to your main stage amp.The way it works in principle is actually quite simple. You first send your output to a pre-conditioning unit. This could be a low-wattage solid state amp, or even a valve amp. This is also where you add effects, so you could run this into your pedal board, then into the low wattage amp. The net result is that the guitar outputs more energy than was put in, providing for what Woody calls a much fatter, fuller tone than you would get from other guitars. In addition, adding to the natural resonance are copper bars that run through the body to the neck, creating a direct coupling between the neck and the guitar. Very cool. Woody B also uses very high-grade woods with four to choose from: Swamp Ash, Alder, Mahogany, and African Black Limba (I dig the Black Limba, myself). For those of you “in the know,” you might ask, “Moog already did something like this.” Yes and no. Yes, from the perspective that the Moog guitar uses a pre-conditioner. But no from the perspective that Woody has taken a completely different approach to the electronics in the Drive System. First of all, where the Moog has around 3000 parts to produce its sound, and I believe requires external power, the ICG Drive System has only twelve parts. Furthermore, the Drive System is completely passive, not requiring any external power source. Finally, the Moog guitar costs in the neighborhood of $6000, whereas you can get into an Internal Combustion Guitar for as low as $1700. Woody is really trying to keep the price below or as close to $2000 so his guitars are attainable by a wider audience. Folks, this stuff is so awesome! I can’t wait to try one out! For more information, go to Woody B Internal Combustion Guitars. Nice post, intresting read. Keep posting and I’ll come back for some more reading! Thanks!